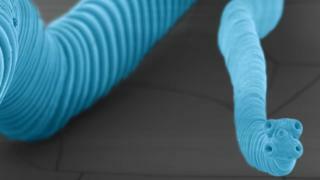 A man has died with tumours made of cancerous parasitic worm tissue growing in his organs, doctors report. The patient had HIV and his weakened immune system allowed the worm-cancer to flourish. The unusual case was diagnosed through a collaboration between the US Centers for Disease Control and the UK's Natural History Museum. Doctors said the case, detailed in the New England Journal of Medicine, was "crazy" and unusual. Colombian doctors had tried to diagnose the 41-year-old man in 2013. He had what appeared to be normal tumours, some more than 4 cm across, in his lungs, liver and elsewhere in his body. But on closer inspection the cancerous cells were clearly not human - they were tiny at just a tenth of the size of a human cell. "It didn't really make sense," said Dr Atis Muehlenbachs, who picked up the "crazy" case at the US Centers of Disease Control. He ran through several theories including shrinking human cancer cells or even a newly discovered infection. Eventually, molecular testing identified high levels of tapeworm DNA in the tumours and the reaction was "complete disbelief" from Dr Muehlenbachs. He told the BBC News website: "This has been the most unusual case, it caused many sleepless nights. "It should have been obvious this was cancer or an infection and not being able to tell between the two for months is unusual." The patient was too sick to treat by the time doctors were able to identify the cause of his tumours. He died, in Medellin in Colombia, three days after the worm DNA was discovered. The worm tissue in question came from dwarf tapeworm - Hymenolepis nana - a specialism of Dr Peter Olson from the Natural History Museum. "There is something very special about this species," he told the BBC, "It is able to carry out its whole lifecycle in one host and that is absolutely unique." Around 90% of the worm's body is given over to reproduction as it spews out thousands of eggs into the gut every day. Rather than the worm getting cancer, it is thought one of these eggs penetrated the lining of the intestines, mutated and ultimately became cancerous. "They were dividing and proliferating out of control and that is really what defines a cancer so they had a tape worm tumour," Dr Olson said. Up to 75 million people have an H. nana infection at any one time. Doctors believe that worm-cancer is rare, but know many cases could be going undiagnosed. The US Centers for Disease Control said hand washing and cooking raw vegetables was the best way to prevent infection. There have been some cases of cancers going from one person to another through organ transplant or in the womb. Another cancer, this time in dogs, has been spread from canine to canine for 11,000 years. Prof Mel Greaves, the director of the centre for evolution and cancer at The Institute of Cancer Research in London, said the latest case was "interesting and unique". He told the BBC News website: "What is extraordinary is that it is free cells of the parasite growing and in a cancer-like fashion rather than whole tapeworms. "Species from almost all invertebrate phyla can develop cancer and the potential seems inherent to animal cells, and particularly the stem cells of multicellular animals. "What has transpired in this case is that an exceptional combination of circumstances permitted this potential to be expressed in a very foreign host." Video How did man die of cancer from a parasitic worm?